Sometimes I just crave beef. I try not to eat too much red meat, but there are times when a big piece of cow just hits the spot. I picked up a 4 pound rump roast at the store and decided to roast it up. Served it up with some roasted asparagus and ranch style potatoes. Didn’t I just say in a recent post that I roast everything? And have a posted a recipe for my ranch potatoes aka home fries aka pan fried potatoes? I don’t think so… Hmmmm… Might have to remedy that soon. Start with the roast at room temperature. Leave it out for a few hours. When you start to get going on your roast, preheat your oven to 375 deg F.
Prep your roast by cutting a few shallow slices in the meat randomly and sliding in those peeled garlic cloves. If the cloves are huge, slice them in half or thirds. If the roast is very lean, coat in a thin layer of oil. Add salt and pepper all over and place the roast in a pan with the fat side up. 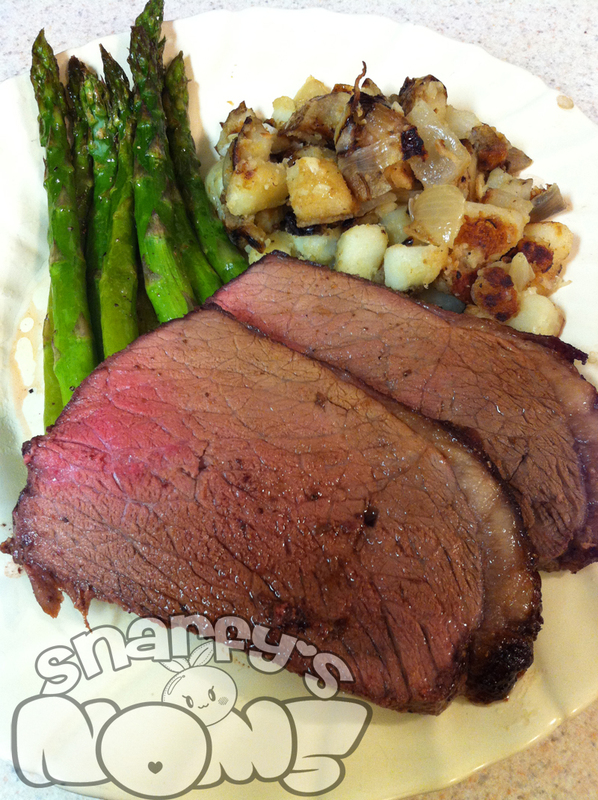 Roast in the oven for 20 minutes per pound. Use a meat thermometer to determine doneness and remember to let your roast rest 15-20 minutes before cutting in to it. You can find a good meat temperature guide here.